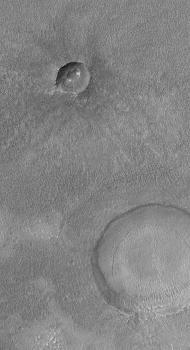 This Mars Global Surveyor (MGS) Mars Orbiter Camera (MOC) image shows two craters and a rough-textured surface in Icaria Planum near 44.5°S, 109.8°W. Both craters have been buried by a thin mantle of material that eroded to form a rough texture. The ejecta pattern from the smaller of the two craters is still apparent through this mantle. While this is a southern mid-latitude surface, similar textures and thinly-buried craters are common at northern mid-latitudes, as well. Sunlight illuminates the scene from the upper left; the picture covers an area 3 km (1.9 mi) wide.